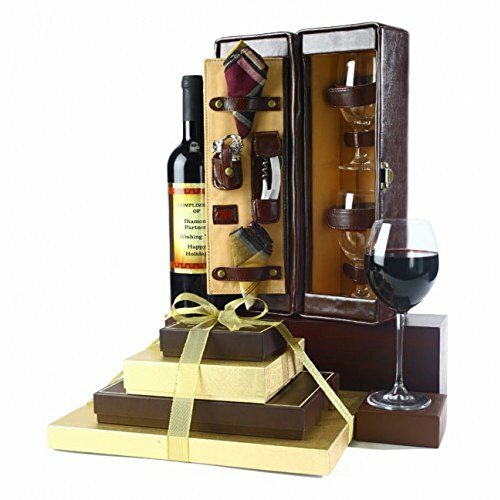 Executive 4 tier gourmet chocolate tower elegantly paired with a very upscale premium leatherette insulated wine case with a removable shoulder strap. Gift Contents include a bottle of personalized Cabernet Sauvignon wine, glasses, 2 fancy napkins and a waiters corkscrew. Luxurious 4 Tier Signature Gold & Brown Tower includes a Rich & Exquisite Gourmet Assortment of Creamy Milk & Dark Chocolates, Signature Truffles, English Butter Toffee, Caramels, Meltaways & Pecan Caramel Turtles. Gift basket include: a bottle of personalized Cabernet Sauvignon wine, glasses, 2 fancy napkins and a waiters corkscrew. Luxurious 4 Tier Signature Gold & Brown Tower includes a Rich & Exquisite Gourmet Assortment of Creamy Milk & Dark Chocolates, Signature Truffles, English Butter Toffee, Caramels, Meltaways & Pecan Caramel Turtles.